That sounds safe doesn' it! We got a couple of wee pumpkins for the kids to make jack o lanterns. They were very excited about scooping out the guts. I didn't have any newspaper to put down, and knew they would have fun getting as messy as possible and would need a bath afterwards, so I figured why no just do the whole thing in the bath anyway. 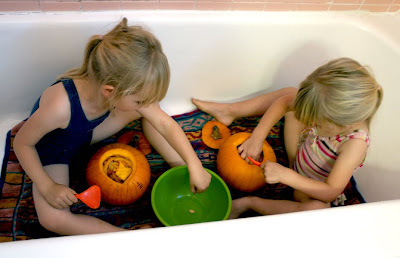 They thought it was funny to be sitting in the bath in swim suits scooping goop out of pumpkins too. 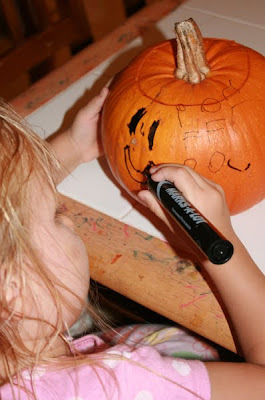 Once the pumpkins were emptied and the kids had had their bath, they drew faces on their pumpkins with perminent markers. Me and the hubbins carved out the shapes that they had drawn for them. They were very proud of their creations, and I love the wee little happy face that my three year old did on hers. The night before halloween, one of our mates got us to carve a big pumpkin with another friend's face on it. This is the bit with the power tool. I used a proxxon to carve it out and made as insanely huge mess in the kitchen. I don't know what I was expecting to happen when I brought something rotating at a few thousand rpm in contact with a raw vegetable (it was lots of fun though). Next year I will either purchase a medical visor and wrap the whole room in cling wrap a la Dexter, or I will use lino cutting tools like this smart lass! Lol - that is the best post title I've seen in ages...! 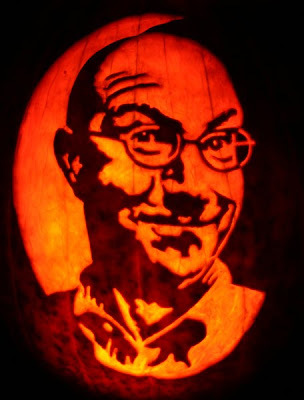 that is an amazing carving job on that pumpkin! The bath tub is brilliant!! I adore reading your posts. I see so many creative things that make me wish you'd been blogging when my own were still young. However, I'm saving ideas for when I become a grandmother! My only bad thing is that now when I see neat projects at other places, I find myself wanting to send you the links. Great idea to carve in the tub! Last pumpkin- very impressive. 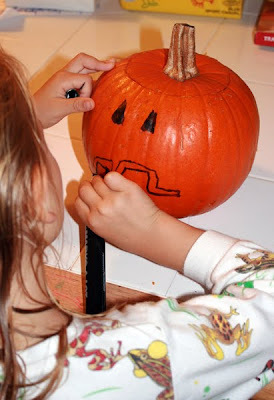 Your pumpkin looks great! 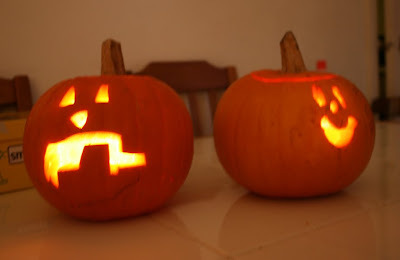 I've used a dremel on my pumpkins before with the same result. However, the dremel works really well on artificial funkins. Thanks guys. Bitingback, I'd be totally happy about you sending me links to fun projects that you find elsewhere! I do try to keep up with a few other blogs, but I can never find enough time to explore all the wonderous crafty messy kiddy corners of the interwebs. Team work in that area would definately help! Thank you for the award Jen. I'll thank you proparly in a post when I get a mo and check out the other blogs you linked to as well! Some thank yous and some other stuff.